We’d love your help. 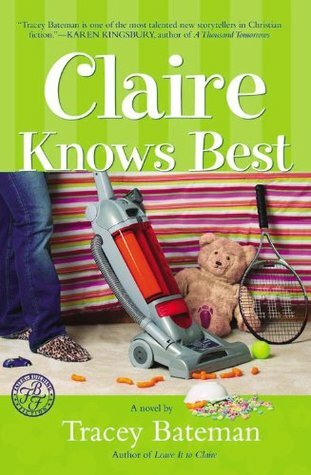 Let us know what’s wrong with this preview of Claire Knows Best by Tracey Bateman. To ask other readers questions about Claire Knows Best, please sign up. I have enjoyed the 3 books in this Claire series. These are the first books of Tracey Bateman's that I have read. Very rarely do I get this excited about a certain author in particular ( except for the Fifty Shades series of course :). I think the biggest attraction was how relatable Tracey made the main character. I could definitely relate to an author who too is from the mid west! I enjoyed how real Claire is as she is facing life as a Christian women, divorced with children. It made me laugh a lot (she can be quite sarcastic). I read the series and liked all of them, but this first one was definitely my favorite. I think I have found a new author! What I learned from this book: That it's important to thoroughly read the back cover before you check a book out of the library. Oops. Christian Romance really isn't my genre, lol. That being said, this book is a fine example of the genre. It's got romance, it's got christianity. It's not particularly cleverly written and is a little formulaic, but I suspect that's par for the course in this kind of book, so I really can't complain. What a funny and down to earth book. Love, love, loved it! Claire is such a normal person, with all her quirks and flaws and downright caring and loving personality! The people around her can’t help but love her. This is such a great series—I’m on to book three! An old favorite! I was having a really hard day, and picked it off the shelf to read to help me laugh! It was not long when I was laughing despite my bad mood! Claire is so relatable, funny and totally someone I wish I could be friends with in real life. I really enjoyed this one, perhaps more than the first. The first book I liked because of her parenting, quick wit and very real responses. This book reminded me how much people are put in our path for a reason. Sometimes we get to have them for a while and sometimes it is quick and it is up to us to learn and grow from the experiences we have with them. In the book Claire saves a man's life by giving CPR, her relationship with her ex-husband, while not healed, is in the beginning stages of forg I really enjoyed this one, perhaps more than the first. The first book I liked because of her parenting, quick wit and very real responses. This book reminded me how much people are put in our path for a reason. Sometimes we get to have them for a while and sometimes it is quick and it is up to us to learn and grow from the experiences we have with them. In the book Claire saves a man's life by giving CPR, her relationship with her ex-husband, while not healed, is in the beginning stages of forgiveness and moving on. She is acquainted with a neighbor and server at a restaurant that happen to be and estranged father and daughter. The daughter is able to see her father slightly differently and give a little opening for a relationship to begin. There is even something to the relationship that she has with the ornery neighbor that ends up giving acting lessons to her son (and is the father of the previously mentioned server). Like every parent, she faces the challenges of giving her kids a little more freedom and being scared at the possibilities and reigning them in when they make poor choices. I like that when her daughter Ari made the choice to go out with with her friend and some college boys for pizza and another time to a party that there were consequences. The fabulous part in this story is that while she was a typical teenager, annoyed with her parent and the consequences she had for her actions, she ended up learning something, taking it to heart and making a difference for so many others. It was interesting to see the healing she had with her ex-husband and his wife Darcy. Her own relationship with Greg was nicely done too, with the struggles of potentially being a pastor's wife. You could identify with the feelings and frustrations. It is so easy to feel like you know Claire because she is so real, saying and thinking what we all do. I think that is what is so appealing to me about these books is that it is real, not all the fluff and hot and heavy romance that other books put on relationships. The main characters in this book all have something they need to work on but they are all working to be better than are. I can't say you walk away with anything that you would want to apply to your life. It is simply a fun book, easy to get involved with, and when it is over you are content and feeling good about the read. I'm glad my friend introduced me to these books. They aren't my usual read but I'm truly enjoying them. #2 in the 'Clare' series (I found out there is a 3rd which I am now starting). I liked this one a lot too. This is a good book to read when you just need a quick read. It's a really cute story about a mom of 3 who thinks that she isn't good enough to be a pastors wife. Enjoyable sequel. Wish that Claire would learn to trust God more. I only vaguely remember reading this. I do remember liking it. These are Christian fiction and a good lighthearted read. I really enjoy them! Very funny book. This is a new author for me & I look forward to reading more of her books. I loved this book. I could not stop reading, wondering what would happen next. Looking forward to the final book in the series, but sad it will end. Same comments as for the first book in the series. Tracey Bateman is also published as Tracey Cross, is the Christy award-winning author of more than thirty titles and has nearly a million books in print. She lives in Missouri's Ozarks with her husband and four children.